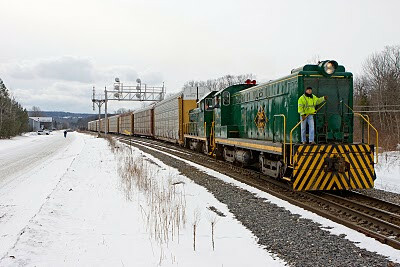 At Delanson, NY the "new" SMS power #2003, a GP-38-3, meets the northbound 938. The 2003 waits for the southbound 939 to pass after their pick-up on this sunny Friday afternoon. 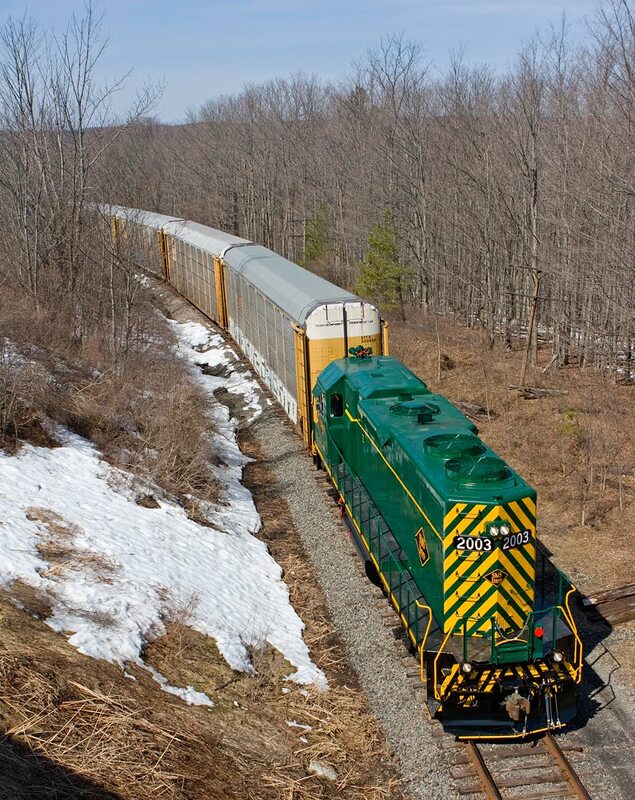 On the Friday, March 19th, the SMS #2003 in her shiny new paint hauls loaded autos up the hill towards the Park. Hadley, NY, Hudson River Falls awaiting trees. 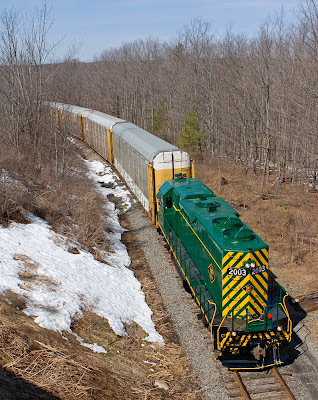 A westbound crossing the diamond with the D&H Adirondack branch. Another view of a westbound crossing the diamond with the D&H Adirondack branch. 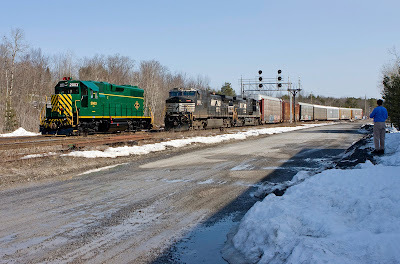 Rounding the bend at Tilson's....On a sunny and warm St.Patrick's day morning Northbound NS train #934 passes by two long time Howes Cave\Schoharie County Fixtures (Tilson's Lunch and the Cement Plant). UP and BNSF power has become a regular fixture on this train and its counterpart. 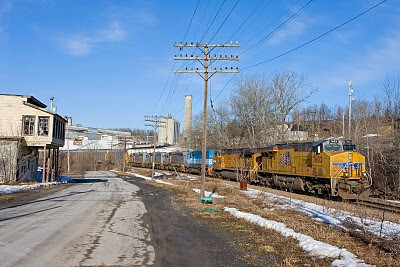 The KCS power seen behind the UP units was recently purchased by Pan Am Railways. The 1845 Howes Cave house can be seen above the train which now houses the Cave House Museum of Mining & Geology. located behind it is the original Howes Cave entrance discovered in 1842 by Lester Howe, along with the Cement Plant and still operating quarry. Bibby and Brain chat in Mechanicville Yard. Brad dispatching the "Northend". We had a good turnout of friends, it was quite interesting trying to run the layout and listening to Bibby tell stories we all had a great time, thanks Brad! Impressive! 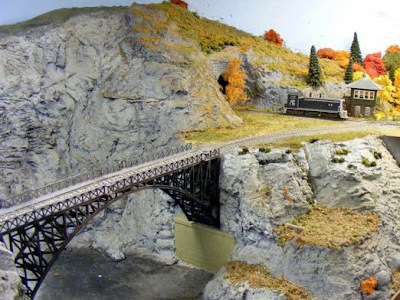 A D&H freight with U33C's rumbles over a large scratchbuilt bridge that Frank constructed out of Central Valley parts. Photo by Mark Oliviere. 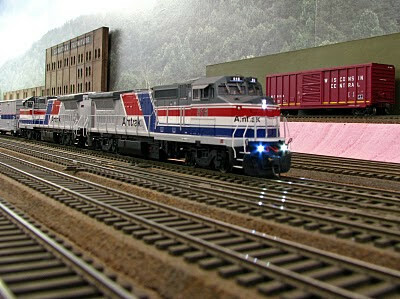 Amtrak passes the Quad Graphics as it races through Saratoga Yard. Frank and Paul look over the staging yards. Photo by Mark Oliviere. 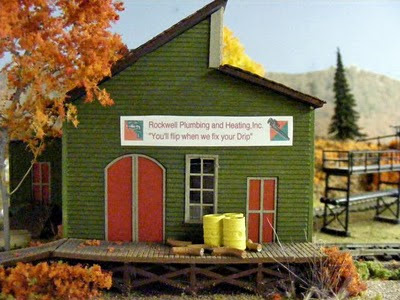 D&H RS-11 switches the newly rearanged paper mill, the valley effect of the buildings works great! 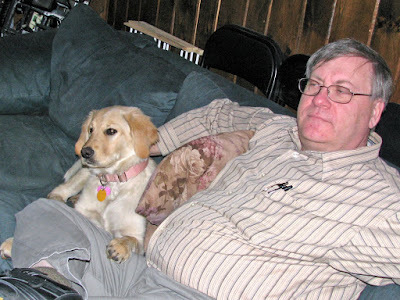 Bob's new friend and Frank's new dog, Angel, watch railroad DVDs. D&H road freight passes through the country side. "MadDog" Bill, Frank and Brad chat, Misch is working on his loco. 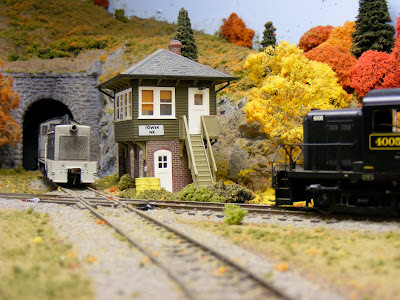 Misch's UP Turbine on it's madden voyage over Frank's layout. 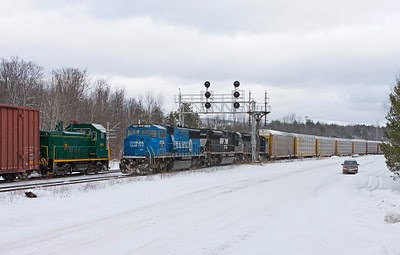 Train 939 with an Ex-Conrail on the point accelerates south on the controlled siding past SMS's NE-1 with Chris and Greg on board waiting patiently to head back to the park with two for McGrand on a very snowy February 17th. A Day that started at 0040 hrs to go plow snow only to end up on a somber note with the passing of my Grandmother. Her and my Grandfather always supported my passion for trains and were always there for me. Thanks Gram! Jeremy keeps a close eye ahead as Chris throws a wave and pulls nine loaded autoracks off CP onto the Albany Main for the trip back to the park. 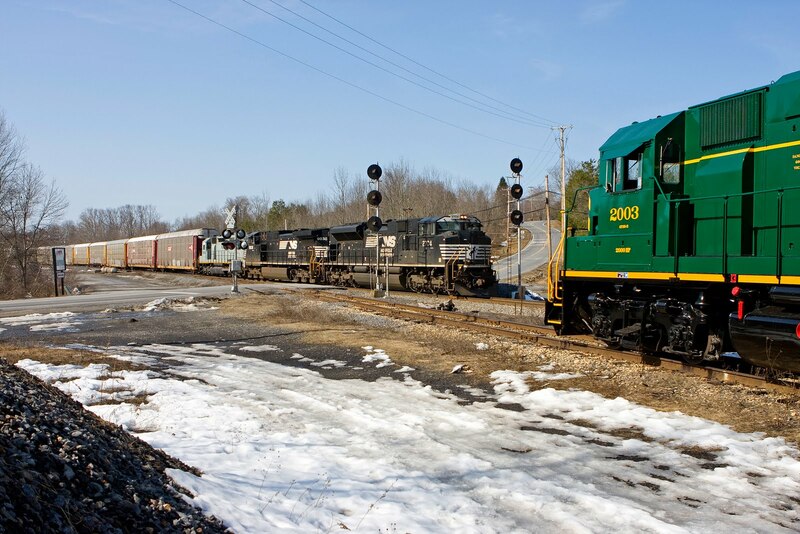 Today's run marked the second time the #301 ran down the Albany Main and onto CP's trackage at Delanson since January. Usually found at the park #301 had to provide extra power for train NE-1. SMS's other EMD switcher that is usually found mu'd to the #1424 was taken out of service due to a bad air compressor at the time this picture was taken. 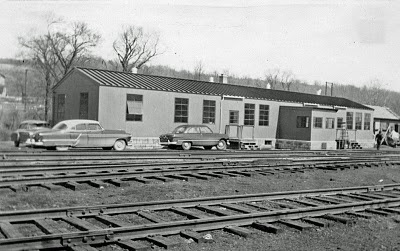 The "new" D&H yard office in Mechanicville sometime in the early 50's. Looks like the finishing touches are being made to the new building. 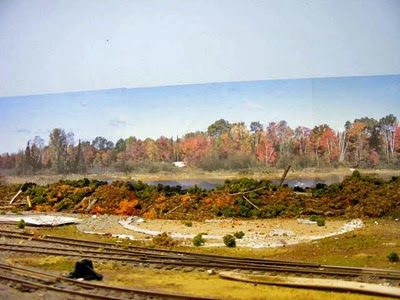 Move ahead to 2010, this is what remains before PAS/NS level it to make way for the "new" Mechanicville Intermodal Yard. Our first 2010 meeting has held at Bob Chase's house. 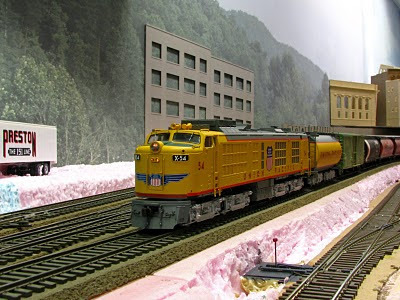 His beautiful Boston & Albany layout as a backdrop, it was good to see old friends and we had a large turnout! My new U-18 "Ethan Allen" with sound is stretching it's legs on the ol B&A! 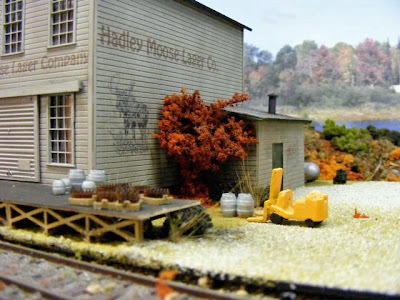 One of Bob's many wood kits he's been working on, this spindle mill will have a new home on an addtion to the layout that he is building. Mark checks all his settings! 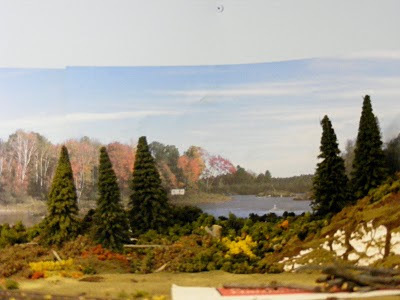 Harold checks out the village of Onderdonk as Brad and Bob look on. Finally, the King! 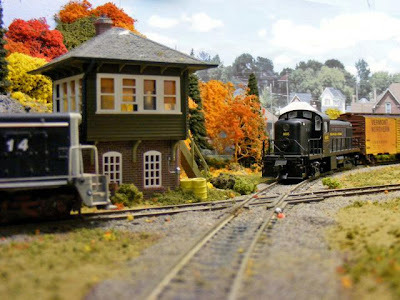 Paul owner of JP's Trains and Hobbies in Latham, NY!